The ships will be armed with Kalibr cruise missiles and will enter the ranks of the Russian Navy in 2017-2018. The first two new-generation corvettes for the Russian Navy will be laid down on Thursday in St. Petersburg, Navy spokesman Capt. 1st Rank Igor Dygalo said Wednesday. "Two new-generation small-size missile ships of Project 22800 will be laid at the Pella shipyard in St. Petersburg on December 24," Dygalo told reporters. He added that both corvettes were expected to join the national fleet in 2017-2018 and would be equipped with high-precision missiles and advanced artillery systems. They will have a displacement of 800 metric tons and a maximum speed of over 30 knots. "It is planned that in the short term, various Russian shipyards will build over 10 Project 22800 small-size missile ships for the Russian Navy," the spokesman said, citing Deputy Commander of the Russian Navy Rear Adm. Viktor Bursuk. 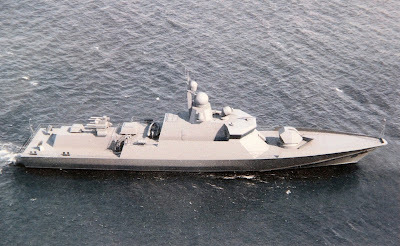 In July, Navy Commander Adm. Viktor Chirkov said that Project 22800 corvettes would replace Project 11356 frigates in the Russian Navy since the latter were to be equipped with Ukraine-built gas turbine engines that Kiev failed to deliver, while engines for the former would be produced in Russia.